Aur Island is a 5km long island about 40 miles off the east coast of peninsular Malaysia and it can be reached by boat from Mersing. There is no dive centre on the island. Liveaboard boats often dive here as part of a safari including Tioman, Redang and Tenggol islands. There is bungalow accommodation on the island. Due to Pulau Aur’s relative remoteness coral reefs are in a healthy condition and visibility is good, at least by east coast Malaysia standards. 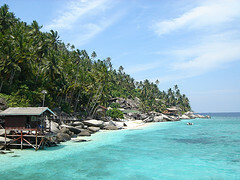 There are more than 10 dive sites around Pulau Aur, Pulau Pinang, Pulau Lang and Pulau Dayang. Deep water channels between the islands can have strong currents which attracts large pelagics including manta rays and whale sharks. Hammerhead shark sightings have even been reported. The east side of Pulau Pinang has a rocky wall that drops off to 50m. South of Pulau Aur are three submerged pinnacles that drop down to 30m. They are covered in pristine table corals. Schools of trevally, batfish and barracuda like the strong currents here. Rayner’s Rock off the north east coast of Dayang Island is a boulder dive site that drops down to 30m and is a favourite dive site as it is the best place to see manta rays and whale sharks. Off the northern tip of Pulau Dayang is a popluar drift dive called Captain Point where manta rays and eagle rays can be spotted. The wall is covered with soft corals. Fish life is prolific including sweetlips, parrotfish, coral grouper and wrasse. Turtles are often seen. Many species of nudibranch can be seen. Night dives are normally in the sheltered bay of Pulau Aur where all sorts of crustaceans can be found. Cuttlefish are also often seen here.